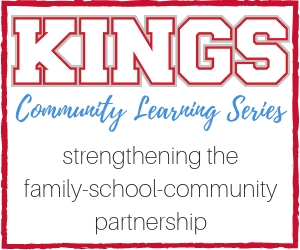 Join us for our next Kings Community Learning Series called, “Anxiety and Your Child: A Primer for Parents.” It will be held on Thursday, January 10 featuring Dr. Rich Gilman, a licensed child clinical psychologist who has over two decades of research and clinical experience working with youth and families experiencing anxiety. The presentation will begin at 7:00 pm at the Kings Junior High School Multipurpose Room (enter door D-5 from the parking lot located between the Kings Junior High School and the football stadium). In this presentation, parents will learn about the signs and outcomes related to youth struggling with anxiety. They will understand why anxiety occurs, and what they can do to help their child overcome it. Dr. Gilman is a Fellow of the American Psychological Association, Editor of School Psychology Quarterly, and has over 100 publications exploring factors that lead to optimal student development.